It’s a cold winter day in Adelaide when we take a ten minute stroll from the central market to keep our appointment at Christie Walk. It feels colder still for us, because we’ve just come from Alice Springs, where it’s cold at night but in the day, the temperate is a balmy twenty-two degrees. We came down to Adelaide on the Ghan – the famous locomotive which began as a camel train and takes its name from the Afghan cameleers who were the first to carry supplies from Adelaide to the desert interior of Australia. Adelaide is not much known for its innovations. It has a reputation in Australia as a sleepy little place – more village than city – where everyone knows everyone else. Perhaps that cosy vibe is why it has now become home to an innovation in community living – a co-housing settlement slap bang in the city centre. 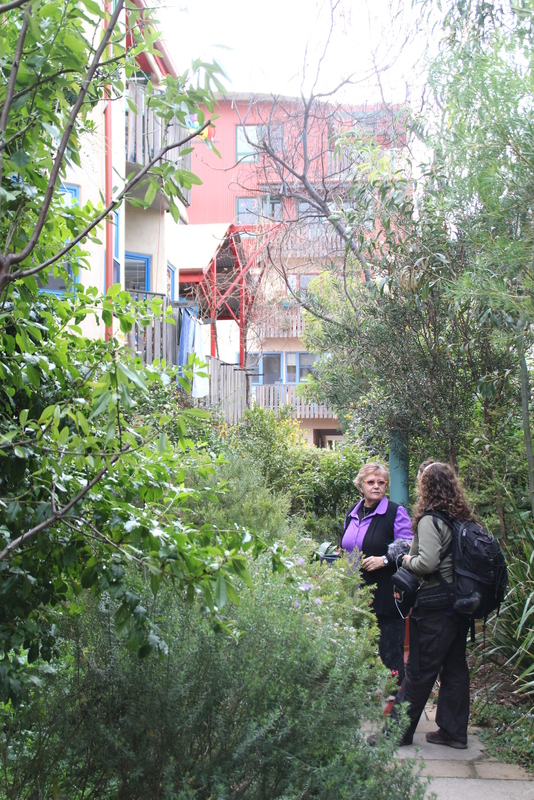 Christie Walk embodies much that is revolutionary about the co-housing movement. As resident Sue Gilbey tells me as we walk around – “ You have an intention to have a community first and you build around that intention. So you begin with the end in mind.” Architect Paul Downton certainly had a vision. His vision included not only community, but sustainability, taking into account elements such as the embodied energy and energy usage; retention and recycling of water; land health and soil fertility through restoration and encouragement of biodiversity and promotion of human and environmental health through limiting use of polluting or damaging products. The result is a compact settlement of 27 homes on half an acre, including two apartment blocks, four individual cottages, a community room and shared laundry facility. We approach from Sturt street through an covered passageway decorated with a mural on one wall. Sue explains that the mural has been created by the residents and tells the story of the building and all the people who have lived here, including a reference to the traditional owners by the presence of the Rainbow Serpent. It gives a friendly flavour to the entrance way. Another unique feature is the community room, which has a fully functioning kitchen. Every month the community meets for a shared meal. Meetings are all held there. There is a piano. They have film nights and talks. And if Sue wants to host a dinner party, she can bring people here. So as well as supporting the sharing economy, it helps people live with less. Sue’s apartment is just 55 square metres, smaller than the average suburban home but with all the advantages of space afforded by a much bigger home. As Sue tells me about the decision-making process, which is based on democratic voting, I ask Sue how she finds living in community. Climbing up to the communal roof top garden, Sue plucks a handful of kumquats and we survey the view over the city towards the Adelaide hills. For a city centre apartment block, Christie Walk does seem to offer the best of everything. The morning feels Autumnal and it is spitting rain when we arrive at number 42 Bamfield Road in the Melbourne suburb of Heidelberg. We are here for an open day at Murundaka co-housing, where 40 people live together in individual units surrounding a central common area. The whole building covers 3 standard blocks, so it makes quite an imposing sight on the corner of the street, but as we wander in past the bursting bike racks, a colourful welcome sign and a table heaving with food present an inviting picture. Murundaka is opening its doors to visitors as part of the final weekend of the Sustainable Living Festival and as an example of sustainable living, this project seems to tick a lot of boxes. Giselle Wilkinson, one of the founder residents, tells how her home of twenty years was bulldozed to make way for the development. Giselle is part of Earth housing co-op, who have owned and let property in this area since the 1970’s. With the co-op as an investment landlord, tenants have security of tenure without having to take out a crushing mortgage and this same ethos has been adopted at Murundaka. On a guided tour, I notice that the apartments are roomy, with an open plan kitchen-living space and a generous balcony. Outside each cluster of units, another balcony space allows for a table in the sun or a collection of pot herbs. Murandaka also has a communal garden, with composting, chickens and a large covered area for outside living. His remarks are particularly interesting for me, since the subject of my latest documentary is just that – how we build community between people. The residents give a predominantly warm and fuzzy picture of life in community. Most of the visitors have come because they would like to do something similar and the residents are happy to share the details of the joys, but also the difficulties of their lives together. “There are a lot of meetings” says Giselle. The household operates on a consensus model and has recently incorporated a technique for collaborative decision-making into their process. This is demonstrated beautifully with a question about whether visitors would like their emails to be shared to everyone present. We used coloured cards to indicate our agreement, dissent or a need for further information and within 3 rounds, a consensus has been reached. We are so impressed, we burst into a spontaneous round of applause! Watch our short film on Murandaka Co-housing. In February each year, Melbourne hosts its Sustainable Living Festival. It’s a celebration, an education and an invitation. We celebrate innovative ideas which bring the possibility of a sustainable future into focus. Films, speakers, presentations, exhibitions, installations, gatherings, debates and demonstrations educate on the theme of living with a more aware, conscious and environmentally friendly approach. We are invited to be inspired. Last year, I was very new to the city. We arrived only 2 weeks before the Festival began and although I went to several events, I felt very much like a tourist. I wandered the Green Market, popped my head into a few tents and watched a film or two in Fed Square. As a newcomer to Australia, what impressed me most was that it was baking hot, but that wasn’t really the point! This year was different. For one thing, I’ve managed to arrange a screening of one of my own films as part of the Festival, so I’m not just a spectator. When I arrive on Friday to drop off some flyers, I am struck by how different this feels. On the stalls are people I know. On the Simplicity Institute stall sits Sophie, who rode across Australia with her partner, Greg, who wrote a book about “Changing Gears” and how to downsize our carbon footprint. On the Co-Housing stall sit Urban Coup members Janice and Yesvira and I bump into Iain from Murandaka. They are here to promote shared living in the suburbs – a great way to reduce our use of energy and resources whilst gaining all the benefits of community life. A little further on I find Karen, from Tasman Ecovillage, which I visited last Easter. 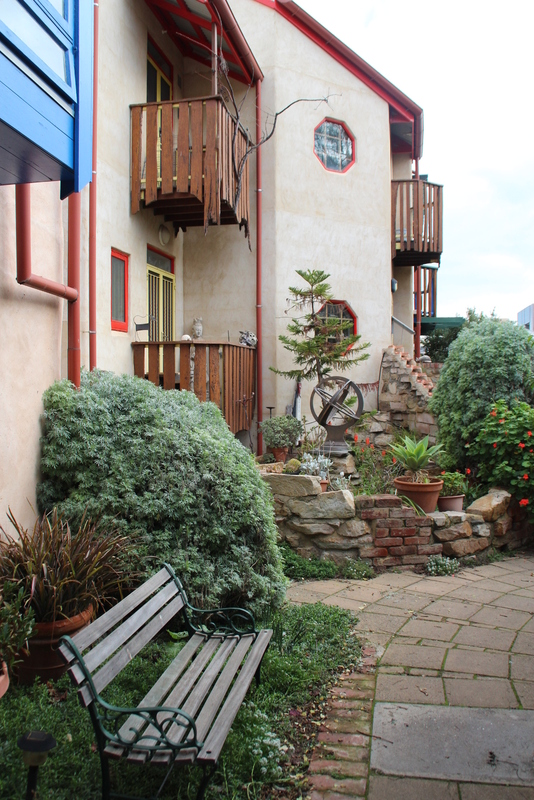 The ecovillage is a new venture down on the beautiful Tasman Peninsular. In a perfect example of re-purposing, this project has taken an existing motel site, sold the chalets to members and have created a community. They grow their own veggies and are planning a range of natural homes on the site, which nestles cosily between the hills and the sea. In a talk on permaculture economics at Under the Gum I find that I know the person sitting next to me – something which never happened last year – and I realise that after a year of homesickness, disconnection and struggle with city life, I live here now. Before I came, people told me it would take a year to “find my feet” and they were right. When it comes to making friends and feeling like you have a place somewhere, it takes time. The comfort I feel in my home town of Swansea is because I have lived there so long. I can’t walk down the street without meeting people I know and if I need something, I know exactly where to go. At the Sustainable Living Festival, I started to feel like I have a place here in Melbourne. Although it is a huge, sprawling city, there are pockets of people who are working towards a more connected and caring lifestyle and I’m pleased to count myself amongst them. Later that night, we are able to take part in the projector bike ride, which we missed last year because we didn’t yet have bikes. A huge swarm of people on bicycles rode en masse through the heart of Melbourne. It was the biggest Critical Mass I’ve ever taken part in and it was great to know that it was in the name of art, not politics! Imagine if the morning rush hour looked like this, not a crush of cars bumper to bumper. We landed at Argyle Square off Lygon street, where the Italians of the area were taking an evening stroll and enjoying some of the amazing ice cream sold in this part of town. The films were projected from a converted bicycle and we sat and ate our picnic supper in the warm evening air. Is this how life could be all the time? For a few months now, I’ve been trying to set up some screenings in Melbourne of the Living in the Future films. Being new here, I didn’t know the right people, the right venues or have the right equipment, but now, it all seems to be coming together. Abbotsford Convent must be one of the coolest venues in the city and it’s here that Ecovillage Pioneers was introduced. The screening was hosted by Urban Coup – a group of people who are setting up a co-housing project in the inner city. Apart from Sanford Housing Co-operative in London, none of our episodes are about cohousing, so I thought it about time we talked about it. 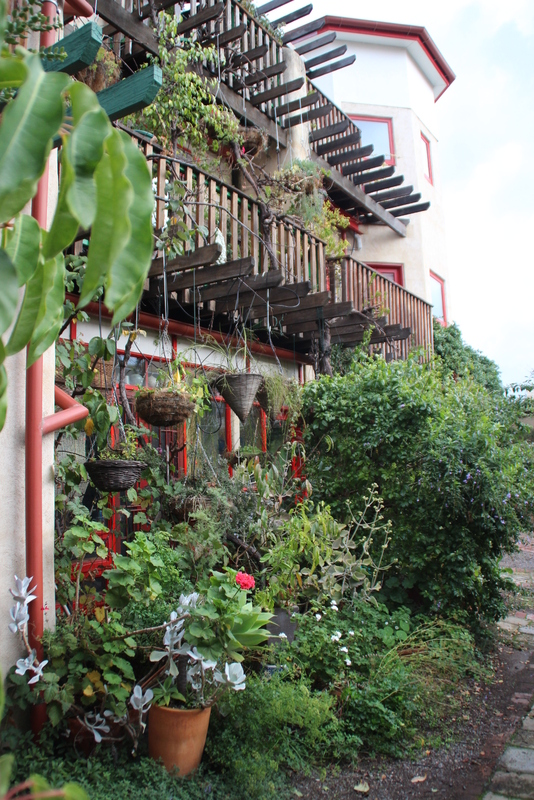 Cohousing projects seek to establish an intentional community in an urban area. The concept has been very well thought out by the Danes and the Americans, who have discovered the optimum number of people, houses and the most successful designs. The Urban Coup are working through their planning process at the moment and looking for a suitable piece of land on which to build. Before the screening, we met at Lentil as Anything – an innovative ‘pay what you think it’s worth’ vegetarian eatery run by goodwill and volunteers. It’s been a feature of Melbourne life since 2000, with a restaurant in St Kilda by the beach and more recently one at Abbotsford Convent. The food is plentiful and delicious. Founder Shanaka Fernando speaks about his journey growing up in Sri Lanka is this TED talk. The new film has no funding at present, but we sold some DVDs and guests were generous with their donations, so I feel it has finally got off the ground. Subscribe to our RSS feed or Newsletter to receive updates. Sarah on Winter Solstice – Create your own Ritual!